Baiba Skride’s natural approach to her music-making has endeared her to some of today’s most important conductors and orchestras worldwide. She is consistently invited for her refreshing interpretations, her sensitivity and delight in the music. The list of prestigious orchestras with whom she has worked include the Berliner Philharmoniker, Gewandhausorchester Leipzig, Münchner Philharmoniker, Royal Concertgebouw Orchestra, Symphonieorchester des Bayerischen Rundfunks, Orchestre de Paris, London Symphony Orchestra, London Philharmonic Orchestra, Helsinki Philharmonic, Gothenburg Symphony. In North America she performs with the New York Philharmonic as well as Boston, Chicago, Baltimore, Houston and Toronto Symphony Orchestras. Further afield she works with NHK Symphony Orchestra, Shanghai Symphony Orchestra and Hong Kong Philharmonic Orchestra. Notable conductors she collaborates with include Marin Alsop, Christoph Eschenbach, Ed Gardner, Susanna Mälkki, Andris Nelsons, Andres Orozco-Estrada, Santtu-Matias Rouvali, Vasily Petrenko, Yannick Nézet-Séguin, Jukka-Pekka Saraste, Tugan Sokhiev, John Storgårds and Simone Young. Contemporary music has become central to Baiba Skride’s music making. In Spring 2019 Skride presents the world premiere of Sebastian Currier’s violin concerto, a co-commission by the Boston Symphony Orchestra and Gewandhausorchester Leipzig. Skride continues to champion Sofia Gubaidulina’s Triple concerto for violin, cello and bayan and celebrates the piece’s Spanish premiere with the Orquesta Sinfónica de Galicia, following on from the successful premieres in the last seasons. Baiba Skride is a sought-after chamber musician internationally. 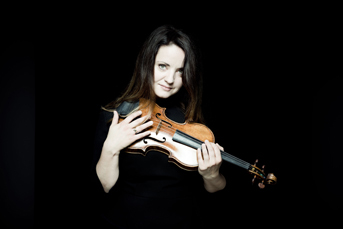 Her chamber music partners include Alban Gerhardt, Brett Dean, Harriet Krijgh, Daniel Müller-Schott, Sol Gabetta, Bertrand Chamayou, Xavier de Maistre and her sister Lauma Skride. Invitations also take her Skride Quartet with Lauma Skride, Harriet Krijgh and Lise Berthaud to Tanglewood Music Festival, Concertgebouw Amsterdam, Vienna’s Musikverein, Philharmonie Essen, Schubertiade Hohenems, Wigmore Hall London, Louvre Paris, Muziekgebouw Eindhoven, amongst others. Skride was born into a musical Latvian family in Riga where she began her studies, transferring in 1995 to the Conservatory of Music and Theatre in Rostock. In 2001 she won the 1st prize of the Queen Elisabeth Competition. Baiba Skride plays the Yfrah Neaman Stradivarius kindly loaned to her by the Neaman family through the Beare’s International Violin Society.